Many people were skeptical about the launch of the Nintendo Switch. The company faced some rocky issues after the abysmal Wii U launch, with a confusing name, and lack of hard hitting third party support from current generation games that the Xbox One and PS4 were receiving at the same time. However, all of the skepticism has slowly washed away after E3, and we are actually seeing an amazing time for the Nintendo Switch. Not even half way into the launch year of the Switch, Nintendo stated that the company wants to sell at least 10 million units by the end of its fiscal year and has the possibility of surpassing that, if their supply meets the demand by Christmas; Nintendo has not updated the sales figures on the console since they announced that they shipped close to 3 million units by the end of March. What is the cause of this? Let’s dive into what is making the Switch pick up so much steam compared to PS4 and Xbox One’s launch. Looking at the launch window of games, we see that Nintendo has obviously hit the ground running with the biggest Zelda title yet, Breath of the Wild, which is shaping up to be Game of The Year for many people. Launching with it was a new Bomberman game from Konami, and a new Blaster Master game from Inti Creates. Leading up to today, we now have a Mario Kart port with all DLC included from the Wii U version, a new IP fighting game in ARMS, and Splatoon 2, set to release this Friday. While these are far and few first party games and exclusives, for the rest of the year , the Switch will see major games that are multiplatform, such as FIFA, WWE, Rocket League, and NBA2K,in addition to more first party titles, such as Mario and Rabbids Kingdom Battle, Pokken Tournament DX, Super Mario Odyssey, and Xenoblade Chronicles 2. At launch of the PS4, the major first party titles we saw from Sony were Killzone, Infamous, MLB, and Knack, while the rest of the first year received indies and major multiplatform games in Assassin’s Creed, Call of Duty: Ghosts, FIFA, Madden, Battlefield and NBA2K, which carried the system strongly through the first year. Microsoft released the same multiplatform, but had Killer Instinct Season 1, Ryse, Forza, Dead Rising 3, Titanfall and Sunset Overdrive for it’s major launch titles as well. In this case, the line for launch games seem pretty blurred between Sony and Microsoft, except for a few very good experiences in the systems’ exclusives. For the Wii U’s launch, it was barebones, with only two first party titles in NintendoLand and New Super Mario Bros U, and exclusives like Monster Hunter 3 Ultimate and ports of previous generation games like Batman and Assassin’s Creed III. For the Switch, it doesn’t seem like Nintendo has major third party support, until you look at when the system launched. Since the system launched in March, it came out where there was no need for consumers or companies to try and to compete for the system. A lot of major game releases take place in the Fall, and the disadvantage Nintendo had with the Wii U coming out of its launch was the fact that companies couldn’t make decent ports after creating their final builds for Xbox One and PS4, having to skip research and development for the system entirely. By releasing it early, it gives developers, especially those like EA and 2K Sports who have yearly releases, to have time to create ports of their games by the time they’re ready for release in the fall. By doing this with the Switch, they have also ensured to the consumer that the release will be on par with the other ports of the game on other platforms. 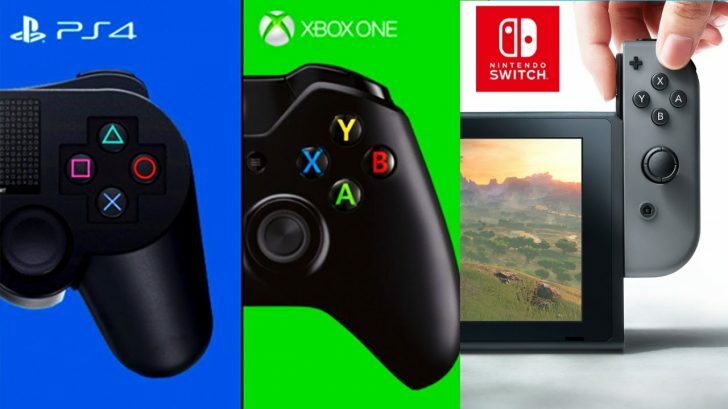 Another big key factor has been the first party games, where Nintendo, and it’s first party developers, and third party partners together are releasing at least one big Nintendo game a month through December, something that both Microsoft and Sony lacked during their launch year. The final key that is playing well into Nintendo’s hands is the word out mouth on how much potential the system itself has, being a portable system. With NicoNico being released, the Switch’s first online streaming service, many users are heavily anticipating the release of other video streaming services like Youtube and Netflix, or even a web browser to use in mid gaming sessions on the go. And while the new Nintendo Online App is receiving negative reception, Nintendo has a fair amount of time to update it before the holiday season, when consumers will come on board to experience the Switch. What are your thoughts on the Nintendo Switch? Do you think that it’s launch is better than the PS4’s and Xbox One’s? What other factors would you consider to attribute to the state of the Nintendo Switch’s Launch? I’m just… not buying this. The only major releases for the Switch thus far have been two ports from its predecessor. In these not quite four months, Zelda and Mario Kart have been the biggest titles to release. At launch, both Xbox and PS4 had Call of Duty, FIFA, Lego Marvel, Injustice, and Madden. NBA 2K and Need for Speed soon followed, and then came Tomb Raider and MGSV: Ground Zeroes. And that’s just the multiplats. Nevermind the exclusives like inFamous, Killzone, Forza, and Dead Rising. If you wanna add smaller titles in, like you did with Blaster Master and Bomberman, then things skew even further away from the Switch. That’s before getting into how fast those two were selling in those first few months. Oh, and let’s not talk about the console’s “online” component. I think the main thing about the Switch was the timing, which the article is pointing out. Those games were built for PS4 and Xbox One’s launches, and the Wii U was an after thought. At least with the Switch, the developers have been given more time to flesh out the “after thought” since most games release before holiday season anyway. There’s no one who would look at the Switch and say its launch was better because of the timing, rather than the sales or library. Someone who DID do such a thing would be accused of reaching, and with good reason. Nintendo abandoned the Wii U and moved all the titles they were working on to the Switch. Oh, you of sort memory! Sure! They are doing great in games this year, but what great games did they release last year? They only are doing good this year cause wasted the last two years of the wiiu to have these games ready for this year.